Now in full colour. 35 profiles. 52 stories and images. • Profiles of Sherry Farrell Racette, Jehane Benoit, Maude Keen Riley, Margaret Mahood, Kimiko Okano Murakami, Elizabeth Sheehy, Louise-Amelie Panet-Berczy, Mary Percy Jackson, Una Abrahamson, Karen Ridd, Jeannine Locke, Mary Barrett Speechly, Olga Trestorff Rains, Rose Fortune, Heather Kuttai, Mairuth Hodge Sarsfield, Thelma Finlayson, Eliza Van Bibber, and more. • Poetry by Waaseyaa'sin Christine Sy, Patti-Kay Hamilton, Lorna Crozier, and Erin Moure. • Topic pages about women's bookstores in Canada, the Canadian Ninety-Nines, the 1975 International Year of Women, the Women's War Conference, lumberjills, Walking With Our Sisters, women at the Oka Crisis, Femme d'aujourd'hui, amauti, and more. 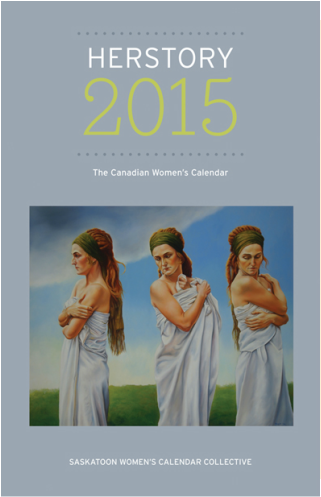 • Artwork by Bernice Friesen, Leah Dorion, Robyn Love, Bev Tosh, and more. • Historical and contemporary photos, including "Madge Smith at her Queen Street Shop," "Nail Driving Contest," "The Runners," "Grenfell Mission Nurse at St. Anthony's Newfoundland," "Cree Woman Who Surrendered At Battleford, 1885," and more. Non-fiction trade paper. $29.95 Cdn. Drawn from the pages of Herstory: The Canadian Women's Calendar, this beautiful book is a celebration of 319 inspiring women. Herstory:The Canadian Women's Calendar has told thousands of stories of women who helped shape this country and culture. Inspiring Women: A Celebration of Herstory offers expanded and updated versions of 319 of these illustrated stories in an attractive coffee-table format. Long-time Saskatoon Women's Calendar Collective members Gail Youngberg and Mona Holmlund selected stories for this anthology, conducted follow-up interviews and research, and recreated these moving accounts. Read about the achievements of Canadian women in chapters covering pioneers, politics, reform, access, achievement and culture.